Cultivation of obligate anaerobes presents a great challenge to the microbiologist, because the cells may be killed if they are exposed to O2 for even a short time. Obviously, special techniques excluding O2 are required for their cultivation. As techniques for cultivating anaerobes have improved in recent years, many more of these organisms are being isolated from various habitats, including wound and blood infections in which they had previously appeared to be absent. Anaerobes that can tolerate a brief exposure to O2 are cultivated in an anaerobe jar (figure 4.8). This is the same type of jar used to incubate microaerophiles, but the chemical composition of the disposable packet converts all the atmospheric oxygen to water. Another method to cultivate anaerobes incorporates reducing agents into the culture medium. These chemicals react with O2 and thus eliminate dissolved O2; they include sodium thioglycollate, cys-teine, and ascorbic acid. In some cases, immediately before the bacteria are inoculated, the medium is boiled to drive out dissolved O2. Media that employ reducing agents frequently contain an O2-indicating dye such as methylene blue. Figure 4.9 Anaerobic Chamber The enclosed chamber can be maintained in anaerobic conditions. A special port (visible on the right side of this device), which can be filled with inert gas, is used to add or remove items.The airtight gloves enable the researcher to handle items within the chamber. 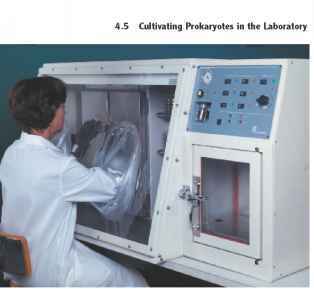 A more elaborate method for working with anaerobes is an enclosed chamber that can be maintained in an anaerobic environment (figure 4.9). A special port, which can be filled with an inert gas, is used to add or remove items. Airtight gloves enable researchers to handle items within the chamber. Enriched sample is plated onto appropriate agar medium. A pure culture is obtained by selecting a single colony of the organism of interest. 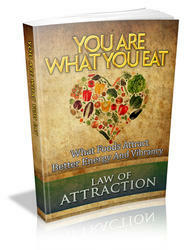 Medium contains select nutrient sources chosen because few bacteria, other than the organism of interest, can use them. Sample that contains a wide variety of organisms, including the organism of interest, is added to the medium. Organism of interest can multiply, whereas most others cannot. Figure 4.10 Enrichment Culture Medium and incubation conditions favor the growth of the desired organism over other bacteria in the same sample. 96 Chapter 4 Dynamics of Prokaryotic Growth is present in relatively small numbers. For example, if an organism is present at a concentration of only 1 cell/ml and it is outnumbered 10,000-fold by other organisms, isolating it using the streak-plate method would be difficult, even if a selective medium were used. To enrich for an organism, a sample such as pond water is placed into a liquid medium that favors the growth of the desired organism over others. For example, if the target organism can grow using atmospheric nitrogen as a source of nitrogen, then nitrogen is left out of the medium. If it can use an unusual carbon source such as phenol, then that is added as the only available carbon source. In some cases selective agents such as bile are added; the procedure is then referred to as a selective enrichment. The culture is then incubated under temperature and atmospheric conditions that preferentially promote the growth of the desired organism. During this time, the relative concentration of a microorganism that initially made up only a minor fraction of the population can increase dramatically. A pure culture can then be obtained by inoculating the enrichment onto an appropriate agar medium and selecting a single colony.